I don't get it. They had my attention. I clicked on their linkbait which brought me to their website. If I enjoyed what I saw, I might click on another content, which may cause me to bookmark the site and come back next time. Websites like these, they have so many widgets that it distracts from whatever message they are trying to convey. Instead of distracting us with useless widgets, why not come up with better content? 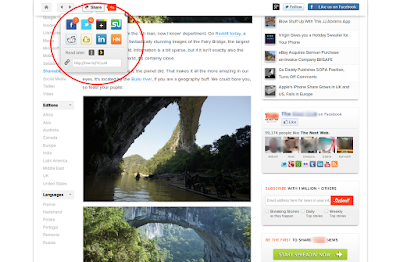 If I enjoyed visiting your website, I have widgets on my browser so I can share, like or bookmark your site. I will look for your call to action when I am good and ready.